Salt Spring Island was first named Admiral Island (circa 1858) by Captain Richards, after his superior officer Rear Admiral Baynes. The local residents of the time insisted on calling it Salt Spring, because of the 14 or 15 natural saline springs that occur on the island. Eventually, the mapmakers renamed it officially. Ganges Harbour was once known as Admiralty Bay. 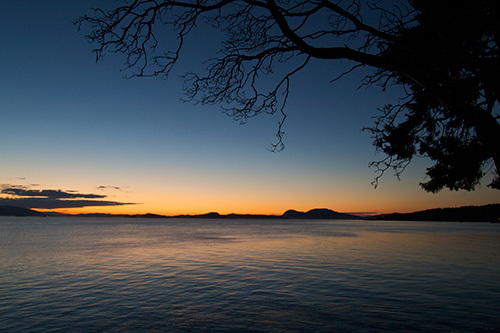 Salt Spring Island was originally a hunting territory for the Cowichan and Saanich Indians. Part of the Coast Salish Indians, they spoke Halkomelem, and Lekungenung. The first non-native settlers were former black slaves from the United States, and arrived around 1857. 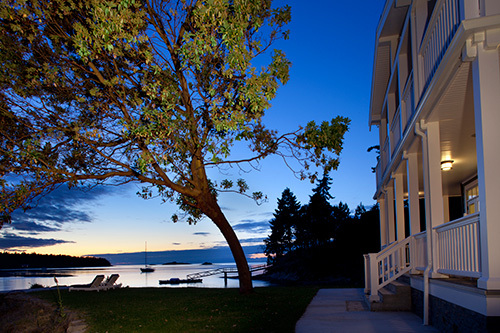 Galiano Island is a long, relatively narrow, island of 57 sq km. It is the second largest of the big islands. Galiano has a population of about 1000. Pender is actually two islands, a North and a South island. Before 1911, the islands were joined by an isthmus. Saturna Island is the most southern of the large Gulf Islands. Go much south of Saturna and you are very soon into American waters. There are many smaller islands scattered among the big Gulf Islands, including private islands, British Columbia marine parks, and members of the Gulf Islands National Park Reserve. With the exception of Thetis Island and Kuper Island, there is no BC Ferries service to these islands. Cabbage Island is located off of Saturna Island, near Tumbo Island. D'Arcy Island is located just south of Sidney Island. Named after Lieutenant John D'Arcy, R.N. of The Herald. Dayman Island is located beside Thetis Island and Hudson Island. It is about 24 acres in size, and is a private island. Gossip Island is located beside Galiano Island, in the open Georgia Strait, just outside the entrance to Active Pass. Hall Island all Island is located beside Reid Island. Hudson Island is located beside Thetis Island, and Kuper Island. James Island is located beside Sidney Island. Kuper Island is named after Captain Augustus Leopold Kuper of the British HMS Thetis. Link Island is north of De Courcy Island, and south of Mudge Island. Moresby Island is just south of Salt Spring. Named after Rear Admiral Fairfax Moresby R.N. Mudge lies accross False Narrows from Gabriola Island. It is near the northern end of Valdes Island. Norway Island is about 30 acres in size, and is located beside Kuper Island. Piers Island is located south of Salt Spring Island, near Portland Island. Portland Island is located south of Salt Spring Island, and is near Moresby Island. Pylades Island is located beside Valdes Island, and north of Thetis Island. Pym Island is located between Portland Island and the Saanich Peninsula of Vancouver Island. 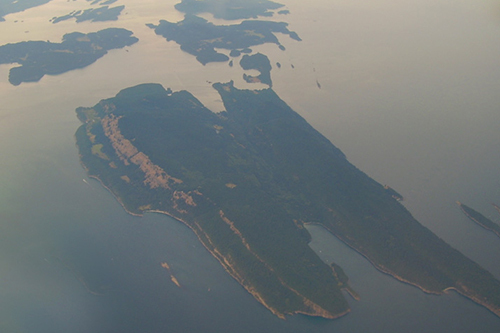 Reid Island is located between Galiano Island and Valdes Island. Russell Island is located at mouth of Fulford Harbour, and is a member of the Gulf Islands National Park Reserve. Ruxton Island is located beside Valdes Island, and north of Thetis Island. Samuel Island is Samuel Island is about 328 acres in size, is located between Mayne Island and Saturna Island. Secret Island is located beside Prevost Island. Secret was once owned by David Conover, who also owned Wallace Island. 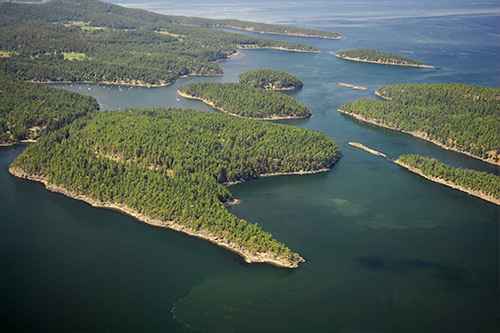 Secretary Islands are two islands located beside Galiano Island, close to Porlier Pass area. Sidney Island is located 3 miles from Sidney, and Victoria airport. Tent Island is next to Kuper Island, is also a Native Persons Reserve..
Thetis Island Thetis is located north of Salt Spring Island, next to Kuper Island, and can be accessed using BC Ferries. Tree Island is about 300m off Pylades, and is very small. It is diamond shape, and has several trees on it. Tumbo Island is located on the eastern side of Saturna Island, and is about 120+ hectares in size. Valdes Island lies North, across Porlier Pass, from Galiano Island. Wallace Island is located next to Galiano Island. Whaleboat is located off the southeast end of Ruxton Island, and used to be known as Eagle Island or Indian Island.